For the first time, they've revealed how a protein called ubiquitin tags the vacuole hiding Toxoplasma. The cell's acidification system then destroys it. 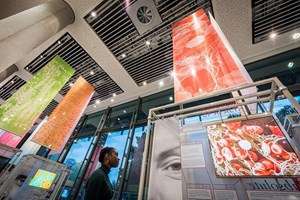 Eva Frickel, the research group leader at the Crick who led the work, explains: "The parasite Toxoplasma gondii resides inside a vacuole in the cells of the organism it infects. The vacuole provides a safe haven for the parasite where it can multiply and cause damage to the host. Until now, it was unclear what defence mechanisms human cells deploy to the vacuole to clear and eliminate Toxoplasma. We have found that a human protein called ubiquitin tags the vacuole for destruction via the cell's acidification system." Toxoplasma gondii is a parasite found almost everywhere. It is in soil and unwashed food, but its most important host is the cat. It causes an infection called toxoplasmosis that can cause miscarriage and is especially damaging to people who have a weakened immune system, others never know they've been infected. "This work is the first demonstration of how ubiquitin tagging leads to vacuole-lysosome fusion in human cells infected with Toxoplasma," Eva says. "Until now, it was thought the vacuoles were not susceptible. Mouse studies have shown a different route to fusion between the vacuole and lysosome. This raises questions for further studies on how vacuolar-lysosomal fusion in human cells happens and why the human cellular immune response is different from the mouse." Eva's research team explores how human cells react to Toxoplasma and what it is that makes it one of the most successful parasites on the planet. There is no vaccine to protect against Toxoplasma infection or medicine that kills the parasite. Eva talks about their work and shares images from the progress they are making in research in the Crick's first public exhibition (above). How do we look? is a collection of scientific images that could be mistaken for works of art though each has been created by a scientist to solve a research problem.